Cotterman Co., a manufacturer of steel rolling ladders, and the recipient of the 2011 W.W. Grainger, Inc. Partners in Performance Supplier of the Year Award, devotes a part of its success to its ongoing collaboration with the Lincoln Electric Automation Division. In 2011, Croswell, Mich.-based Cotterman was able to enhance operator efficiencies and productivity, reduce manufacturing turnaround time, lower inventory costs and maintain product quality by incorporating Lincoln Electric's Robotic Welding System 55 in its manufacturing facility. The System 55 is a pre-engineered dual headstock robotic welding cell, designed for large sized parts that can be welded using the flexibility of reorientation. Using customization on both sides of the cell layout, Cotterman welders were able to weld the entire rolling stair tread on Side A and weld common parts, fixtures and components on Side B. With the new addition of the System 55 from Lincoln Electric Automation, Cotterman reduced its finished inventory to zero, created a just-in-time manufacturing process and improved order fulfillment to 48 hours or less. "The service from Lincoln is the best in the business," says Cotterman Vice President Nick Valore. "Teaming with Lincoln is a no brainer." A case study detailing the collaborative project and a supplemental video complete with interviews from Valore, as well as Cotterman's president, Clint Stimpson, are available. These can be found on www.lincolnelectric.com/en-us/equipment/robotic-automation and http://www.youtube.com/weldrobotlady. 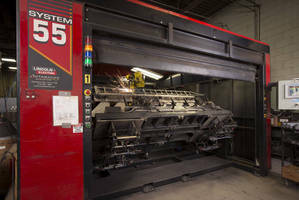 For more information on the Cotterman Lincoln Electric Robotic System 55 Case Study, request case study MC12-69 by visiting www.lincolnelectric.com or calling Lincoln Electric at (888) 355-3213. For information and resources on Lincoln Electric robotic welding solutions, go to www.lincolnelectric.com/automated-solutions or send questions and inquiries to automation@lincolnelectric.com. The Lincoln Electric Company, headquartered in Cleveland, Ohio, is the world leader in the design, development and manufacture of arc welding products, robotic arc welding systems, fume extraction equipment, plasma and oxyfuel cutting equipment and has a leading global position in the brazing and soldering alloys market.